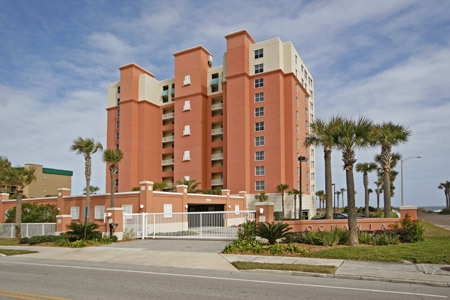 Oceania condominiums in Jacksonville Beach, Florida. Oceania is a private gated oceanfront condominium located just two blocks from Jacksonville Beach Town Center. Enjoy elegant costal living with spectacular ocean views from your own balcony. Completed in 2001, Oceania features 12 stories with open floorplans and a wide array of lavish interior appointments including spacious master bedrooms with sliding glass doors to expansive 10' x 30' balcony, large walk-in closets, ceramic tile flooring, crown molding, custom kitchen cabinets, solid surface countertops and security system. Amenities include oceanfront heated pool, whirlpool, fitness center and sauna.